Students are constantly struggling with study skills, especially in 9th grade as we start to think about end of year testing. It is difficult to “know where to start,” which is fair, considering there is a lot of material to cover! They are overwhelmed by the information and are still learning how to manage their time. I was hoping to relieve some of this stress by creating personalized study plans for each student. I know, I know, a lot of you are rolling your eyes thinking, “How will I have time to do this? 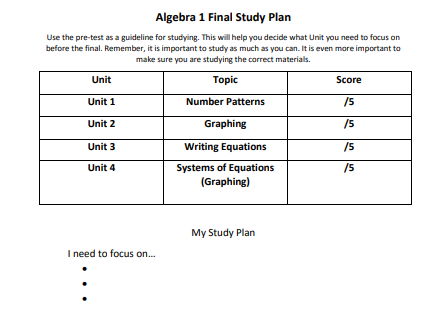 !” Using Woot Math and a quick worksheet, I was able to make study plans for all three sections of Algebra 1, on the spot, during a 45 minute class period. I know, it is very hard to believe. In my Algebra 1 classroom, I start preparation by gauging students knowledge. What do my students need to know to be successful? Where are they struggling? What have they mastered? I answer all of these questions with a pre-test using Woot Math! If you want to check it out right away, click the link below. Continue reading to see how I use the poll. My final is separated into four distinctive units: number patterns, graphing, writing equations, and systems of equations. I took five key questions from each unit and created a set of twenty questions. In class, I had all of the students work on the poll using the “self-pace” feature with automatic feedback turned on. You can see my student’s results below. Once students have completed their poll, they sit with me and we analyze their results using the results page shown above. I quickly count how many they got correct out of the five questions per unit and calculate their scores. Then, working together with me we create their own personalized study plan. I made this very quickly using a word processor. I have used study plans in the past and students respond very well to them, and they continually request them. Parents are thankful that their students have a plan of attack to be successful during finals. Special education teachers are grateful for the guidance, not only for the students but for themselves! 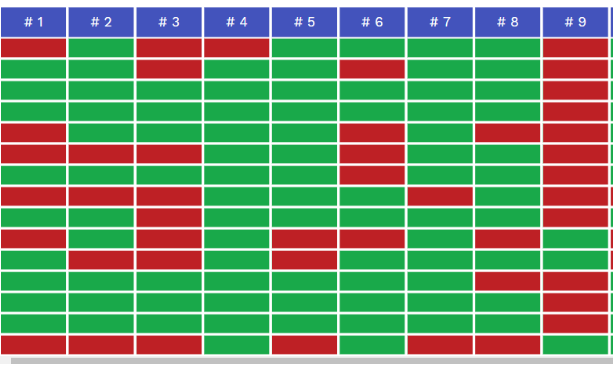 This allows students to clearly understand where their skills are lacking and where they shine. Also, meeting with students one-on-one to check in before finals is a great way to instill confidence in your students. This structure knows no limits! Whether you are teaching math, history, science, you could use this as a tool for your classroom! You can add reflective questions to the study plans to encourage students to think about their goals and not just memorize formulas. How do you prepare your students for finals? Do you let them run free and learn study skills on their own? Or do you have an awesome game that you play? Whatever it is, we at Woot Math would love to hear about it! Good luck studying! Woot! Woot! Diana Rapp is a full-time math teacher at Fairview High School. She has been a mathematics teacher for two years. 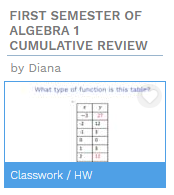 Growing up, Diana struggled in mathematics. She learned quickly at a young age that she would have to work hard and productively struggle constantly in order to be successful. Along her journey as a student she was lucky enough to have incredible teachers and tutors that gave her the tools to succeed and instill confidence in herself. Diana became a teacher because she believes she can be that mentor for her struggling students. Diana has a BA in Mathematics and is currently working on her Masters in Mathematics Education Curriculum and Instruction.